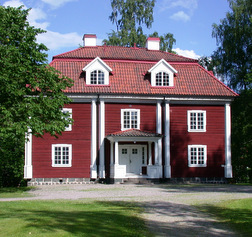 August 2016: I just returned from a month of study in the application of classical architecture in Ängelsberg, Sweden. 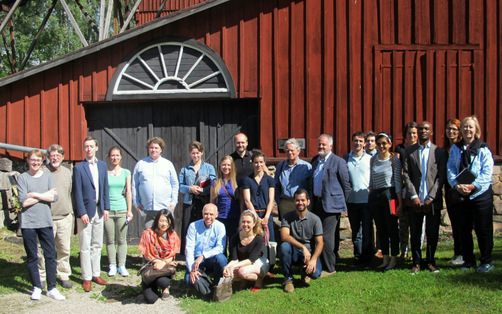 Course was jointly sponsored by INTBAU, International Network of Traditional Building, Architecture and Urbanism, a Prince Charles Foundation, and the Ax:son Johnson Foundation in Sweden. It took place at the restored Engelsbergs Bruk, a 17th century ironworks in the Dalarna region, and now UNESCO World Heritage Site. Our gracious hosts, the Ax:son Johnson Foundation, provided everything for us, 21 participants from 10 countries, to fully engage the work and create a remarkable learning experience. 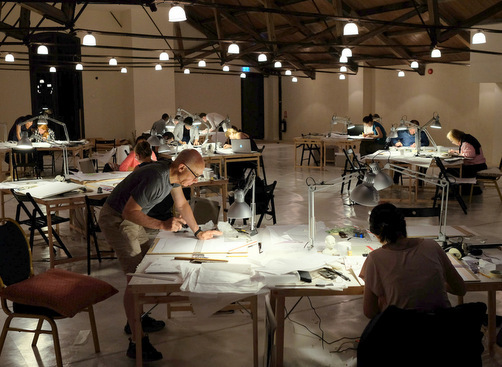 The tutors were leading classical architects and urbanists from the UK, Netherlands and US. Our studio was the full attic story of a repurposed factory above reception, meeting rooms, dining hall and kitchen. Drafting tables were placed in groups of three at one end, and easels at the other. We had ample opportunities to develop our skills in sketching and life drawing. The days were as full as in grad school with lectures, design projects, field trips and discussions. Some projects were designed in teams of three, with new teams for each assignment. Our primary urban design project was to evaluate and design new traditional buildings to improve the Västerås central square. The participants' varied cultural backgrounds, experience and age greatly enriched the process and designs. 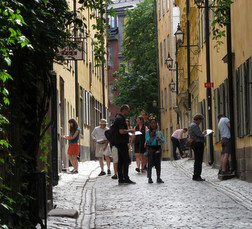 In our last week the course moved to Stockholm for "Swedish Grace" tours and a drawing assignment in the Gamla Stan. In review, the participants' work was remarkable and exceeded everyone's expectations. The best of it will hopefully be published in a booklet by the Ax:son Johnson Foundation, and the course will continue as an annual summer event. For me, it was very encouraging to see young people take to traditional architecture, and to be seeking more meaningful roles in the profession. January 2015: Thanks to clients for posting reviews of our work on Houzz.com. and thanks to those who follow us. We received "Best of Houzz" awards for design and client service again this year, and also became "Recommended Pros" on the popular site. February 2013: We received a 2013 "Best of Houzz" Design Award for our portfolio on this website which has really taken off. Several of our clients also posted reviews. Thanks to all of you! December 2012: Our Wallingford Craftsman renovation and restoration received the 2012 Wallingford Design Award. Awards Coordinator Mike Ruby writes: "Congratulations on creating a fine example of remodeling that we hope others will attempt to emulate. You retained the bungalow character ...using an updated version of Craftsman vocabulary ...and keeping the structure in scale with nearby houses." In other words, we didn't blow-out the house to fill its zoning envelope like so many other projects. Thank you for the award! August 2012: Homestead and Community on the Middle Border, an essay by cultural geographer Carl Sauer, has been added to Opinion section. This remarkable essay introduced a new generation to the character and contributions of the "Middle Border" period (1800-1860)-- when Midwest was the frontier of westward expansion. Sauer combines overarching trends with critical details to provide a clear view of its significance, what was lost and could perhaps be recovered. Including it here with our introduction will hopefully reach a new audience. August 2012: Our "Greek Revival Cottage" design and Cottage Classics series were featured in the Fall-Winter 2012 issue of Early Homes (PDF). Construction drawings and panelized kits from Connor Homes for this cottage are available. Contact us if you are interested. July 2012: Next Greek Revival could be coming to a declining empire near you. The classical precedent that fostered civic growth in the United States (1830-1860) could be emulated today, if only we were so lucky. June 2012: Remodel or Remuddle? essay has been expanded to discuss character of successful renovations. Houses are products of their times and have distinctive character. Successful remodeling requires working in empathy with the existing house and design intensions of builders. If you can, the results will be much better. April 2012: Cottage Character notes have been expanded to include implications for today's cottages, how they can become "affordable housing" while avoiding pitfalls of conventional development. January 2012: We just rebuilt a 1949 house in Spokane, WA, after it was heavily damaged by fire. It was rebuilt from the first floor up, so our client asked us to improve interior layout of rooms and spaces within its existing footprint. We also enhanced the house's mid-century Modern character. 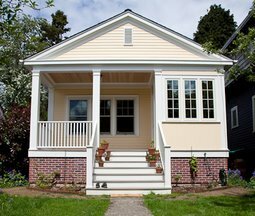 January 2012: New second floor addition for a 1910 Wallingford Craftsman has also just been completed. Roof was rebuilt at a slightly higher pitch and shed dormers added to increase useable floor area. Second floor includes new master suite, two bedrooms for the kids, bath and laundry. Ceilings are vaulted and finished with natural fir bead board. Radiant heating, ample insulation and new windows make it very comfortable. Entry porch roof and pergola are new. Shingles were pre-stained cedar, and match original pattern. 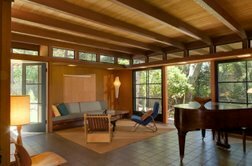 December 2011: Photographs of our living room addition to a 1949 Mid-Century Modern house in Altadena, California have been added to "Renovations and Additions." Project was located in foothills above Pasadena on a large lot with extensive gardens. Our addition included entry, living room and a covered terrace. We preserved the original open plan and indoor-outdoor character of house, and made an effort to distinguish new work from existing without harsh contrasts. November 2011: Dominic Bradbury interviewed us for his feature story, "Crafting a New Tradition," which appeared in the October 15, 2011, Financial Times home supplement. Bradbury asked about our restoration of the 1910 Parsons House in Altadena, CA and ongoing interest in Arts & Crafts movement. The full interview, Impact of Arts & Crafts Revival, is posted in Opinion section. September 2011: Thanks to everyone who visited us last weekend at Historic Seattle's Bungalow Fair. This was our 13th consecutive year at the Fair. We enjoyed seeing old friends, and meeting new bungalow enthusiasts. May 2011: The Chief Goes Through is our tribute to American painter Ernest Blumenschein, a founding member of the Taos Society of Artists. 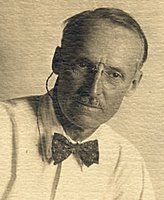 He was born this month in 1874. We wondered what was on his mind in 1956 when he painted this, his last major painting. January 2011: Editors of Old House Online write: "We've seen plenty of great bungalow transformations grace our pages over the years. Here are ten of our favorites." At the top of the list we find "Slow & Steady", our restoration project Ballard Craftsman, published in the June/July 2010 issue of Old House Journal (PDF). Hey, thanks! 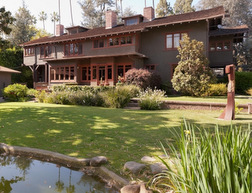 Beautiful Simplicity: Arts & Crafts Architecture in Southern California is a film by Paul Bockhorst Productions, and available on DVD from www.bockhorstproductions.com Film segments include Pasadena architects Louis B. Easton and the brothers Arthur and Alfred Heineman. Interviewed by Bockhorst, we comment on their work and contributions. 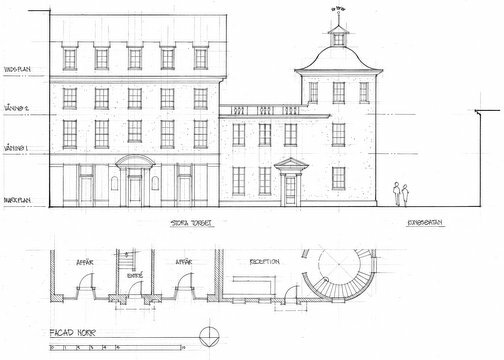 Our Parsons House restoration is also featured. 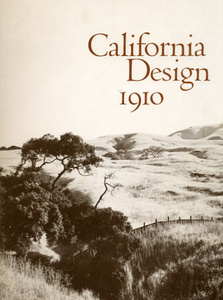 California Design 1910 was authored by Timothy J. Andersen, Eudorah M. Moore and Robert W. Winter with photographs by Morley Baer. The book accompanied a 1974 exhibition organized by California Design, and codirected by Eudorah Moore and myself. Our presentation of the Arts & Crafts movement in California followed by only two years Robert Judson Clark's landmark Princeton University exhibition, "The Arts and Crafts Movement in America 1876-1916." The two exhibitions brought renewed attention to the creative expressions of the period and initiated a revival that has been sustained for four decades. We will always be grateful to Eudorah for this amazing opportunity and life experience. Bungalow Nation authored by Diane Maddex with photographs by Alexander Vertikoff includes three of our restoration/renovation projects, identified as: Arroyo Seco, A Moving Experience and Shipshape.